The Six Change Approaches by Kotter & Schlesinger provides six practical strategies to overcome resistance to change. Businesses must constantly evolve or they will die. New technology, new competitors, changes in government regulations, and new opportunities are just some of the reasons causing organizations to need to change. Implementing change isn’t always easy. One reason for this is that some or all of the people within the organization can be resistant to change. Even if employees understand the logical need for change, they can be resistant because of an emotional feeling of loss and the dread of the turmoil that the change might bring. These feelings are neatly summed up by the first few phases of the Change Curve. When people are first informed of the change they are shocked. They can’t understand the need for the change and they don’t believe that it will happen. They become frustrated and will frequently try to resist the change. People resist change in different ways. Some people may withdraw into themselves. Others may respond aggressively. Some might even try to secretly or overtly undermine the change. Understanding how individuals within your team might resist change will make you better able to select the right approach from the Six Change Approaches to counter that resistance. This is important because unless you are able to understand the root of peoples resistance you will not be able to select the right approach to overcome that resistance. People resist change when they feel that they, personally, will lose something of value. When this is the case, people will be more interested in how the change impacts themselves, not on how the change impacts on the success or otherwise of the organization. Resisting change in this way often gives rise to subtle office politics, where people try to undermine the change under the surface of what they are saying, in an attempt to stop the change before it has even begun. People resist change when they misunderstand the implications of the change. This can happen when trust is low between managers and employees. Here, the employees fear management isn’t being entirely honest with them, and consequently they will lose out in some way. Lack of trust can result in a change that is actually beneficial to employees being met with resistance. People resist change when they assess the situation differently from those initiating the change. Perhaps they see more costs than benefits to the change. Not just for themselves, but also for the organization. Managers are not always in possession of all of the facts. For this reason, this type of resistance can occasionally be a good thing, when employees make managers aware of previously unforeseen issues. People resist change when they have been working the same way successfully for years. They fear that they will be forced to change the way they work. They fear they may not be able to adapt or learn the new way of working. Because of a low tolerance for change, employees often resist change even though the change would be a positive change for them. Kotter & Schlesinger suggested the following Six Change Approaches as techniques to handle resistance to change. To mitigate resistance to change you can educate and communicate your team about the change before it begins. This will help team members to understand the logical need for the change. It is better to over-communicate than to under-communicate. Because of this, consider using a range of techniques from one-to-one meetings, Q&A sessions, town hall meetings, and presentations. Use when your team has a lack of information or inaccurate information. Once on board with the change people will be more willing to get involved with its implementation. It is very time-consuming to repeatedly communicate with every member of an organization. To mitigate resistance to change you can involve team members likely to resist the change to be involved in some aspect of designing the change. By helping to design part of the change people will feel much more bought into it. They will have ownership. You get their commitment, not just their compliance. Use when you need team members to embrace the change and they have considerable power to resist the change. Use when the change isn’t fully understood at the outset and you need help to design the change. With more input from more people, the quality of your change plan will improve. Potential resistors to change will be bought into the plan. You need to be careful that team members don’t design an inappropriate change. This can be time-consuming. To mitigate resistance to change you can support people through the change. This could mean providing them with training and education, or it could mean providing them with emotional support. 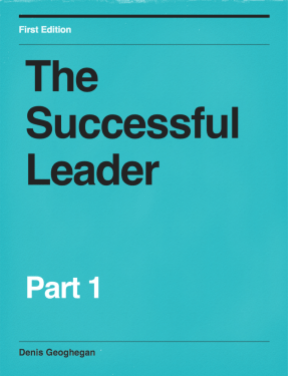 This can be particularly challenging for tough, driven managers. 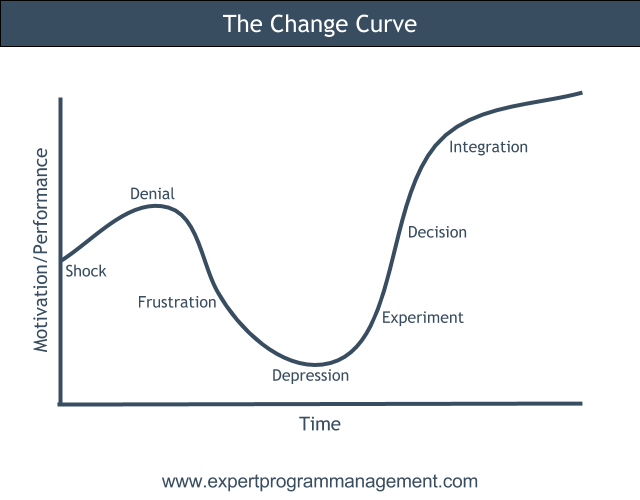 Familiarize yourself with the Change Curve, to understand what kind of support is needed at each stage of the curve. Use when people are resistant because of fear and anxiety. This is the best approach to use with fear and anxiety. This approach can be time-consuming, expensive, and yet still fail. To mitigate resistance to change you can come to a negotiated agreement with potential resistors. A financial incentive could be offered, for example, to encourage people to change their ways of working. Any agreement reached should be written down and formal so it can be referred to later. Use when someone stands to lose out from the change. In this situation, it can often be the easiest way to avoid major resistance. It can be a quick and easy way to avoid resistance. It can be expensive if everyone wants compensation to accept the change. To mitigate resistance to change you can use manipulation and co-optation. Manipulation involves using information in a selective way to encourage resistors to behave in the way that you want. Co-optation can work for individuals or groups. For an individual, it involves giving them a role as part of the change management team. For groups, it means giving a group leader, or someone the team respects, a role as part of the change management team. Manipulation and Co-optation can be seen as unethical, but it can often be the only option available to you when other options fail or are too expensive. It can be a quick and inexpensive way to overcome resistance to change. Can lead to problems, or intensify resistance, if people feel they are being manipulated. To mitigate resistance to change you can use explicit or implicit coercion. Here you essentially, implicitly or explicitly, threaten team members to accept the change. This could mean that you threaten they will lose their job, or it could mean you threaten to transfer them to a different part of the organization. Use this method when the speed of change is important, for example, during a turnaround situation. This method is quick. It can overcome all types of resistance. It can be risky. Team members can be furious at not just the change but also how they are being handled. Here is a quick recap of when of use each of the Six Change Approaches along with their respective advantages and disadvantages. 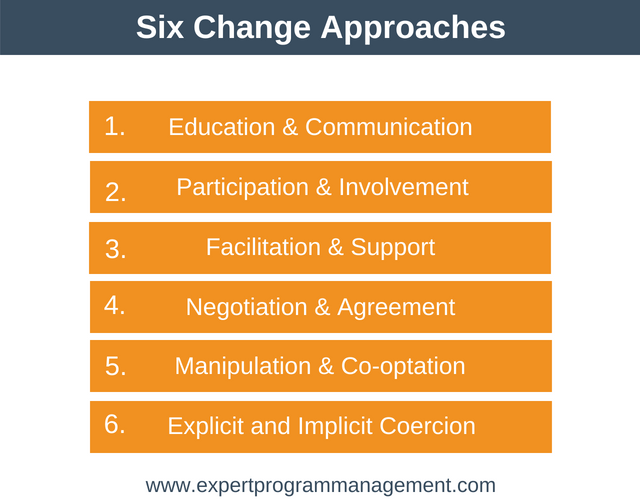 The real trick to using the Six Change Approaches model is to realize that the approaches are not mutually exclusive. You can if you wish to make use of all of the methods together to try and bring different individuals within the organization onboard with the proposed change. Another factor that will influence which methods you choose is whether the change needs to be implemented quickly or more slowly. Super fast change can only happen if the change is already clearly understood and planned. Quick change has little need for involvement from others. This type of change is business critical and just needs to happen. There is no time for delay. No thought can be given to the feelings of those involved. During this type of change, the approach you choose should lean towards the more coercive and manipulative. Conversely, where the change isn’t that clear at the outset, and the involvement of others is needed to make the change a success, then the change will happen more slowly. During this type of change you’ll want to minimize resistance, and so a more communicative and engaged approach should be chosen. Employees can be resistant to change for a variety of reasons. As managers, it is easy to forget that there are multiple approaches available to us to overcome change as part of any change management initiative. 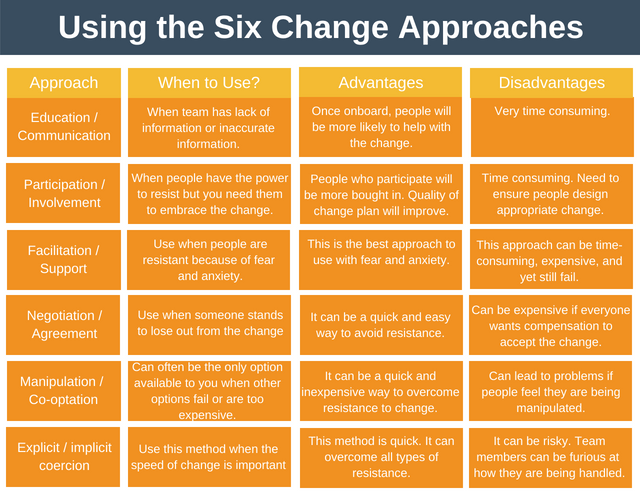 The Six Change Approaches provides six strategies for overcoming resistance to change. Essentially, it’s an easy to use checklist of the options available to us, along with guidance on when each approach works best.